I should have steel guitar arrangements up and going soon. Feel free to download the sample arrangements (see below) and steel guitar lesson pages to get a feel for what the arrangements will look like. Thanks for your patience! 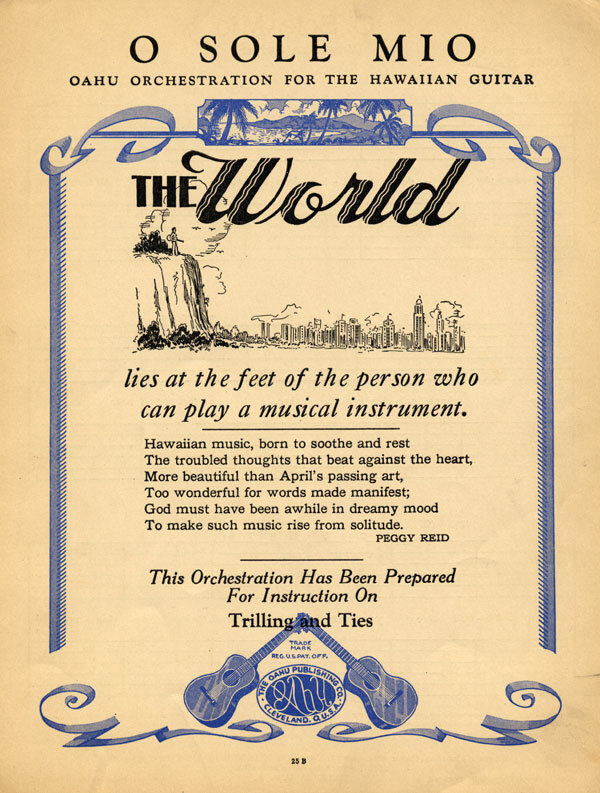 A classic vintage Hawaiian arrangement folio from Harry Stanley and Oahu Publishing. My steel guitar arrangements are carefully prepared with quality music engraving software and include notation of important steel guitar techniques and phrasing such as hammer-ons, pull-offs, glisses, and slant bar positions. I'm incorporating what I feel are the best ideas from existing publications, staying with familiar markings whenever possible. The arrangements include a standard treble clef (placed above the tablature staff) to notate rhythm. Standard notation is the fastest, most accurate way to get all the picking information you need—when to pick a note and how long to hold it. You are free to download sample arrangements of "Coconut Grove" and "Bubbles In My Beer" and sample instruction pages I use in my private lessons. Eventually I hope to incorporate these lesson pages into a comprehensive steel guitar instruction book. In addition, I just posted a couple of music theory primers you may find helpful. You can also download a newly updated tablature key that explains all the notation symbols you will need to play through the arrangements, including tempo, rhythm, and phrasing markings. Tablature is a great way to learn the basics of a steel guitar arrangement. However, there's no substitute for hearing a performance. I will provide audio versions of each arrangement, which will include a rhythm track you can use to practice with. Each arrangement comes in one of five basic tunings: C6th, C13th, A6th, B11th and E13th. Others will probably be added. Stay tuned! The tunings are shown and spelled out in the chart below. Note that the C13th is similar to the standard C6th tuning (E string on top), which was used by many players in the '40s and '50s. Adding the seventh tone (Bb) to the tuning greatly increases its richness, and it has become arguably the most visible tuning in Hawaii over the last 20-30 years.